The emissions reduction potential of three carbon dioxide handling strategies for post-combustion capture is considered. These are carbon capture and sequestration/storage (CCS), enhanced hydrocarbon recovery (EHR), and carbon dioxide utilization (CDU) to produce synthetic oil. This is performed using common and comparable boundary conditions including net CO2 sequestered based on equivalent boundary conditions. This is achieved using a “cradle to grave approach” where the final destination and fate of any product is considered. The input boundary is pure CO2 that has been produced using a post-combustion capture process as this is common between all processes. The output boundary is the emissions resulting from any product produced with the assumption that the majority of the oil will go to combustion processes. We also consider the “cradle to gate” approach where the ultimate fate of the oil is not considered as this is a boundary condition often applied to EHR processes. Results show that while CCS can make an impact on CO2 emissions, CDU will have a comparable effect whilst generating income while EHR will ultimately increase net emissions. The global capacity for CDU is also compared against CCS using data based on current and planned CCS projects. Analysis shows that current CDU represent a greater volume of capture than CCS processes and that this gap is likely to remain well beyond 2020 which is the limit of the CCS projects in the database. Society is realizing that we have reached a critical point in our approach to energy use and resulting emissions. There exists an “energy trilemma” where we must consider the security of the energy supply, the costs of that energy, and the environmental impacts created (World Energy Council, 2013). The carbon dioxide utilization (CDU) for chemical synthesis is a growing area of research. Carbon dioxide (CO2) can be used as a valuable feedstock for chemical production and chemical energy storage (Styring et al., 2014). This impacts on two of the key challenges in the trilemma: the sustainable supply of chemicals and meeting energy demand whilst also reducing CO2 emitted to the atmosphere. In treating CO2 as a commodity chemical rather than a waste, it becomes a valuable asset rather than an economic drain. Fossil oils are the primary feedstock for many industrial chemicals, but these are not sustainable as while there is a plentiful reserve of fossil oil and gas, this will ultimately lead to new CO2 emissions when the chemical is used (Berners-Lee and Clark, 2013; McGlade and Ekins, 2015). If emitted CO2 is used as an alternative carbon source for the production of these products, net emissions will be reduced and a sustainable pathway for production will be created. CO2 utilization technologies can either give products that sequester the CO2 for a lengthy period of time (such as polymers or mineralization) or only for a matter of weeks or days as in the case of hydrocarbon fuels and methanol. However, in the case of fuels, we must also consider longer term storage as is the case with seasonal storage: using renewable power to produce liquid and gaseous fuels that can be stockpiled until they are needed. It is a misconception that manufacturing fuels and other short lifetime chemicals by CDU will not lead to a reduction in CO2. These products would traditionally be sourced from fossil oils and once combusted or used would release CO2 to the atmosphere. It is acknowledged that there are substantial reserves of fossil hydrocarbons, however these are so great that ultimately we will not have the capacity to deal with the emissions from them while trying to achieve the two degree scenario for climate change mitigation (IPCC, 2007). When manufacturing chemicals from CO2, previously emitted CO2 will be re-used before it is re-emitted, resulting in a net reduction in emitted CO2. This is of course a consequence of carbon avoided. While this does not sequester as much CO2 as if it was stored geologically or is used to produce long life-time products such as a polymer or mineral; but it does provide a sustainable low carbon pathway for the chemicals industry and a net reduction in emissions. This net reduction and the amount of CO2 that can be utilized to create it should not be disregarded. The chemicals industry needs to become more sustainable and embrace a circular economy and the use of CO2 as a feedstock enables this (Centi et al., 2013). CO2 is a greenhouse gas (GHG) created as an anthropogenic waste product by power generation and many industrial processes. Energy-related emissions of CO2 in 2013 were 36 Gt (Carbon Dioxide Information Analysis Centre, 2014), and predicted to rise to 43 Gt by 2030 (IEA Energy Technology Perspectives, 2014). The Doha amendment to the Kyoto Protocol (2012) gives a commitment to aim to reduce GHG emissions by at least 18% below 1990 levels between 2013 and 2020. In the UK, the 2008 Climate Change Act set a legally binding target to reduce the UK’s CO2 equivalent emissions amount by at least 80% from the 1990 baseline by 2050. Different strategies to reduce CO2 emissions must be employed to reach these targets (Figure 1). The IEA has calculated that in order to give a 50% chance of restricting global warming to 2°C, CO2 emissions must be reduced by 17 Gt in 2030 and 39 Gt in 2050 against projected emissions. To achieve this, the IEA has modeled CO2 reductions scenarios, which include carbon capture and storage (CCS), renewables, end-use fuel and electricity efficiency, end-use fuel switching, nuclear power and power generation efficiency, and fuel switching, to give the desired outcome of a less than +2°C rise. Of these technologies, CDU is most often compared with CCS due to the similarities in the capture of CO2, although how the captured CO2 is dealt with is often very different. Figure 1. 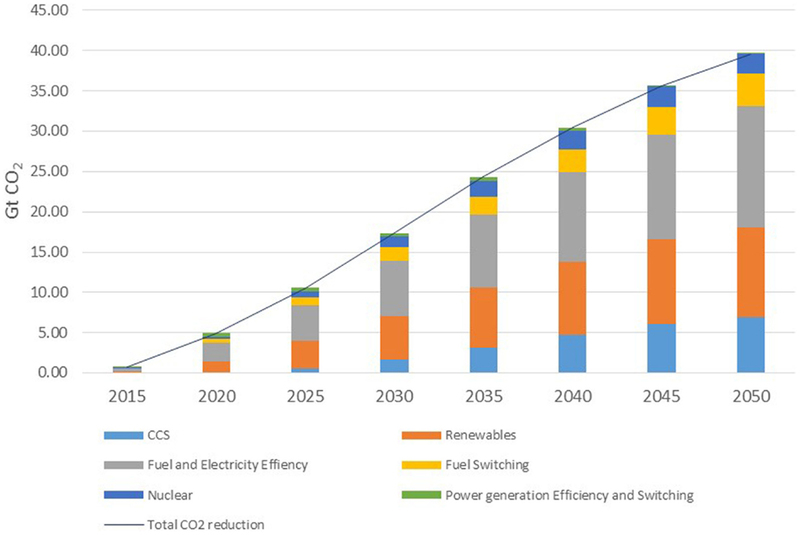 World CO2 reduction targets to meet the 2°C scenario (2DS) adapted from IEA Energy Technology Perspectives (2014). In CCS, CO2 is captured from emitters, separated from the other emitted gases, then compressed and transported, usually via a pipeline, to a geological storage site. These are often a depleted natural gas/oil wells or a saline aquifers. CCS is an effective method of reducing CO2 emissions to the atmosphere, but is costly with an estimated 30% parasitic energy loss for a power generator, as well as substantial capital (CAPEX) and operational (OPEX) costs. There has been considerable debate as to the relative impacts of different carbon capture technologies. It has been a long held belief that CCS represents the best option for carbon dioxide mitigation while giving the cheapest approach to carbon-neutral fuels, still using existing fossil fuel reserves. Furthermore, it is assumed that CO2 use through enhanced hydrocarbon recovery (EHR) in the form of oil or natural gas will aid the economics of the capture process. It has also been suggested that carbon dioxide capture and utilization (CCU or CDU) will only play a minor role due to the huge volumes of CO2 that need to be sequestered. In order to address these issues, we have undertaken a number of studies to assess the techno-economic and environmental viability of each of the processes. This has included considering “cradle to gate” and “cradle to grave” scenarios for different technologies in terms of material balances across the processes. Each of the three processes is considered with a common feedstock: captured and purified carbon dioxide that is piped to the point of storage or utilization. The global status of CCS projects has been compiled by the Global CCS Institute database (2014) “Status of CCS database.” The database divides current and proposed CCS plants according to their phase of development: Operate; Execute; Define; Evaluate; Identify. The nature of the capture process is identified, as is the ultimate destination of the CO2. There are 55 CCS projects currently listed on the database, with a potential capacity of storing approximately 102 Mt CO2/year by 2020 as shown in Table 1. Table 1. The global status of CSS projects in 2014 [adapted from Global CCS Institute database (2014)]. Of these projects, 13 are in the Operate phase with the majority being located in North America. Of this group of projects, only one is associated with the power generation sector: the Sask Power facility at Boundary Dam in Canada which came online in 2014. The facility has a 1 Mt/year capture capacity and the CO2 will be transported by a 66-km pipeline to an enhanced oil recovery (EOR) facility. The Boundary Dam project represents the highest single unit capture facility globally, although there are plans for the Gorgon Carbon Dioxide Injection Project in Western Australia to come online in 2016 with the world’s largest capture capacity of 3–4 Mt/year. Only two facilities in the Operate phase are in mainland Europe, the Sleipner and Snøhvit projects in Norway that take CO2 from natural gas processing plants and store the gas in dedicated geological storage facilities. Taking the operational plants only, the current total global capacity is 26.6 Mt/year. If we now include those projects in the Execute phase, then the total capacity rises to 34.7 Mt/year as there are an additional nine projects assigned to this phase. None of these are in mainland Europe. Extending this to include projects in the Define phase, there are 14 projects identified which includes 4 projects in the UK and 1 in the Netherlands. However, it is noted that three of these are currently on hold and only the Peterhead and White Rose projects in the UK are in the Front End Engineering Design (FEED) stage. If we still include the mothballed projects, the total global emissions capture total a maximum of 58.5 Mt/year. Of the 36 projects in this latter total, only 12 are dedicated geological storage project (although one may adapt into an EOR project) and 24 are EOR projects. Of the 13 projects currently in operation, 10 are EOR installations. By contrast, the Carbon Recycling International CO2 to methanol plant in Iceland currently produces 4 Mt/year consuming 5.5 Mt/year CO2. This is larger than any current or proposed single CCS facility. The energy for the conversion comes from a geothermal source and avoids fossil fuels. This emphasizes the importance of renewable energy in any CDU process. Likewise, it emphasizes the importance of CDU in seasonal energy storage through the production of synthetic gas or liquid fuels. The database is extensive and describes each process, including capacity, operational phase, and origin of the CO2 and its destination in storage or HER facilities. It provides an up to date analysis of all project that could come online by 2020. The spreadsheet is too detailed to discuss in this paper and readers are advised to consult it directly. It is available free of charge from the GCCSI reference given above. Carbon dioxide can also be used in EOR or more generally, to include natural gas, EHR. This is similar in many ways to CCS as captured and compressed CO2 is injected into geological formations. However, these contain trapped hydrocarbons which can be displaced by the injected CO2. In a perfect case of immiscible EOR, the hydrocarbon and CO2 are completely immiscible so do not mix. Instead, an equal volume of hydrocarbon is forced out of the well to be replaced by the CO2. Therefore, the CO2 is sequestered in the geological structure. By contrast, miscible EOR involves the mixing of the CO2 and hydrocarbon. Some of the CO2 is released together with the hydrocarbon while a proportion is sequestered. The relative proportions are dictated by the degree of mixing achieved. In fact, the CO2 released will be recaptured and re-injected into the formation, however to account for this in the functional unit, it must be considered as being non-sequestered in the single pass first injection. Any gas re-injected would necessarily reduce subsequent functional units of CO2, so would perturb calculations. In EHR, the product is a hydrocarbon; typically crude oil or natural gas. Therefore, unlike CCS, EHR will produce a product that on refining will represent commercial value. Hydrocarbons that are otherwise uneconomic to extract are therefore suitable for EHR technologies and this is the general driving force. In CDU, CO2 is used as a carbon source to produce new, marketable products. It is in essence CO2 reuse. CDU technologies can either give products that sequester the CO2 for a lengthy period of time (such as polymers or mineralization); or only for a matter of weeks or days but also perhaps between seasons, as in the case of fuels and methanol. There are many methods for CDU available which include catalytic reduction and direct addition. A full discussion of these methods is beyond the scope of this paper, so readers are recommended to refer to reviews and textbooks that cover the field in depth [for example Aresta et al. (2013) and Styring et al. (2014)]. However, as many of these chemicals would traditionally be sourced from petrochemicals, manufacturing them from CO2 will result in a net reduction in emitted CO2 as shown schematically in Figure 2. We should also note that there is a growing interest in harnessing biological processes in CDU, often coupled to the use of renewable energy integration. These include the cultivation of algae and micro-algae in photo-reactors or open raceways (Jansen et al., 2011). This raises issues of sustainability, characterized by the energy-water-food nexus, primarily through the use of agricultural land for energy-related processes. Consequently, there are concerns whether such processes would be economically viable at scale (Aresta et al., 2013), especially given the concurrent needs for food, energy, and chemicals. The concept of the bio-refinery and advanced bio-manufacturing may go some way to addressing this, together with genetic modification of associated organisms, although this has its own controversies. While this paper does not address bioprocesses, it is acknowledged that once algae are harnessed for enhanced aquatic biomass production, there is the potential for large impact. Aresta et al. (2005, 2013) and Aresta and Dibenedetto (2010) have proposed that production could approach 600–700 Mt in 2020 and 3,000–4,000 Mt by 2050. However, while aquatic algae production appears feasible, land-based production is a challenge. Figure 2. The concept of avoided carbon. Emissions based on no carbon capture and fossil-derived transport fuel (left) and no capture but 5% conversion of industrial emissions into synthetic transport fuel (right). Carbon dioxide utilization is not a new technology. CO2 has been used to produce urea for many decades. 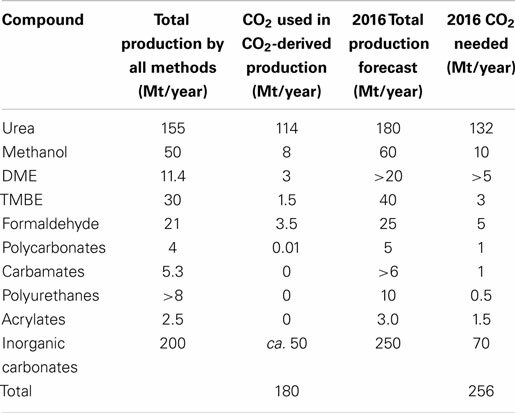 Currently, CO2 utilization processes such as urea and methanol production use 122 Mt of CO2 annually as seen in Table 2 [adapted from Aresta et al. (2013)]. This by far exceeds the current amount of CO2 captured by CCS which is 26.6 Mt/year. Table 2. Current CO2 utilization technologies and forecasts for 2016 [adapted from Aresta et al. (2013)]. To date, there have been few studies on the whole systems, and in particular there are no comparative studies between the complementary CO2 post-emission handling technologies. To consider a relative assessment, we have made a number of assumptions in order to simplify the argument starting from a common input. We have assumed that the CO2 supply originates from a power generator or an industrial emitter and that the CO2 is captured and concentrated on site to produce a common CO2 stream entering the processes compared. In all cases, the captured and purified gas will need to be transported to its final destination. For the purpose of comparison, it is assumed that this will be using a dedicated pipeline. For CCS and EHR, the pipeline is necessary between the capture and the storage site. For CDU, it is proposed that a spur on the pipeline can take a slipstream from the main flow to be diverted to the chemicals or synthetic fuels plant. Of course, ideally the CDU plant would be situated close to the capture plant in order to reduce costs. Therefore, as these processes are common, we neglect the GHG emissions in the early part of the supply chain up to and including the transportation of the CO2 from the capture step. We then compare the net CO2 sequestration at the storage site as the first end boundary condition and then on consumption of the product produced (fuel combustion) as the second end boundary condition. In order to compare CCS, CO2-EOR, and CDU, it is necessary to define a functional unit for the analysis. As there is no product in CCS then an initial functional unit has been chosen to be 1 m3 CO2 input into a process. This can be later scaled or transferred to an alternative functional unit depending on the exact process. For CCS and CO2-EOR, 1 m3 of the gas is injected under supercritical conditions into a cavity of 1 m3. We have taken the density of CO2 to be that of the super critical fluid at the critical point, which is 469 kg m−3. In CCS, the cavity (or pores) is regarded as being empty, or filled with saline water, while in CO2-EOR, the cavity contains crude oil with an average density of 900 kg m−3 and an average molecular formula equivalent to C19H40 (248 kg kmol−1). For CDU, 1 m3 of CO2 is reduced with hydrogen in a power to liquid process to yield nonadecane (C19H40), analogous in molecular weight to the crude oil above. In the case of CCS, the CO2 is simply injected into the cavity under supercritical conditions. The density of scCO2 is taken to be 469 kg m−3 and so 469 kg are sequestered. Therefore, the net sequestration of CO2 is +469 kg. For CO2-EOR, there are a number of scenarios depending on the miscibility of the CO2 with the oil or gas. We will consider two scenarios that liberate the trapped oil. Firstly, this may result from an immiscible injection process whereby 1 m3 of oil is displaced by 1 m3 of scCO2. This will liberate 900 kg of crude oil at the well head, while 469 kg CO2 are sequestered. Again there will be a net sequestration of CO2 at the well head of +469 kg. We also consider a miscible mixing process whereby there is complete mixing to give 50% CO2 and 50% crude oil. Assuming ideal mixing, 469 kg CO2 and 900 kg oil will mix to give a 2 m3 mixed solution. A 1 m3 sample will therefore contain 234.5 kg CO2 and 450 kg crude oil. The mixture released at the well head will therefore also contain 450 kg oil and 234.5 kg CO2 will be either released to the atmosphere or re-injected into the well in a recycle process. However, to keep boundaries consistent, we will take this 234.5 kg CO2 as being non-sequestered. The amount of CO2 remaining in the well will be 234.5 kg and the net sequestration will be +234.5 kg CO2. For CDU, we also make an extreme assumption: complete conversion of CO2 to -CH2- by catalytic Fischer-Tropsch-type reduction. Again, the functional unit is 1 m3 CO2 (469 kg, 10.66 kmol), which is converted to 10.66 kmol -CH2- units, or 0.65 kmol C19H40 molecules. For complete conversion, the net amount of CO2 sequestered is 469 kg. We can also consider other lower concentrations whereby 70% conversion would produce 0.46 kmol product and 50% conversion would produce 0.33 kmol product. The net capture is defined as the amount entering the system minus the amount emitted. For 100, 70, and 50% conversion, the net amount of CO2 sequestered is therefore 469, 328, and 234.5 kg, respectively. The scenarios are summarized in Table 3. Table 3. Net sequestration of CO2 by the different mitigation technologies for “cradle to gate” analyses. As stated, this gives a “cradle to gate” analysis that does not take account of any emissions originating from the product. One of the concerns raised against CDU is that any fuels produced will be eventually re-released to the atmosphere. While this is certainly true, any fuels originating from EOR needs to be considered similarly. Obviously, there will be no emissions as a result of CCS so the net emissions reduction will remain at 469 kg. However, CCS does incur considerable CAPEX and OPEX costs through capture and pipeline construction to the storage site; and solvent regeneration, replacement, and gas compression, respectively. If we consider that immiscible EOR releases 900 kg crude oil with an average molecular weight of 248 kg kmol−1 (C19H40), then the production is 3.63 kmol. On complete combustion, each molecule of oil will release 19 molecules of CO2 (69.4 kmol) with a mass of 3,051 kg. This has a significant effect on the net emissions. The “cradle to gate” emissions reduction of +469 kg then becomes −2,582 kg emitted once the “cradle to grave” scenario is implemented. For the miscible CO2-EOR case, the 450 kg oil produced will release 1,526 kg of CO2 on complete combustion. The “cradle to grave” emissions now become −1,292 kg which is obviously lower than the immiscible case, however less fuel is produced and so lower profit is achieved. The “cradle to grave” analysis for CDU is interesting. The conversion takes 469 kg (10.66 kmol) CO2 and converts it to 0.56 kmol (139 kg) C19H40. Combustion simply converts this back to 469 kg CO2 so there is no net emission over the process. Therefore, 469 kg CO2 are consumed in producing the fuel and 469 kg are emitted through its subsequent combustion, net emissions are zero. However, there is an added bonus, as the CO2-derived fuel will be used in place of a fossil fuel, therefore giving a net emissions reduction of +469 kg. If the “cradle to grave” scenario is employed, this is much more environmentally benign than either of the EOR processes. When considering the production of a fuel, it is more usual to define a quantity of the product as the functional unit. In this case, we will define it as 1 t of oil extracted in EOR or 1 t of synthetic fuel produced from CO2. From CDU, 139 kg synthetic fuel (C19H40) is produced from 469 kg CO2. Therefore, the production of 1 t synthetic fuel consumes 3.37 t CO2. For immiscible EOR, 900 kg crude oil (C19H40) is produced from 469 kg CO2 and hence 1 t of oil is produced using 521 kg CO2. This means 6.5 times more CO2 is sequestered in the CDU process than in immiscible EOR. This is summarized in Table 4. Table 4. Comparisons of net CO2 emissions using the CCS, EHR, and CDU strategies discussed. Returning to the database of CCS projects, it can be noted that of the projects in the Operate phase, 11 are EOR projects and 2 are geological storage projects. Based on our calculations above and assuming an immiscible system, these EOR CCS projects would actually result in CO2 emissions of 128 Mt/year from the combusted oil products. When you then consider the projects in the Execute and Define stages, the situation does improve but not dramatically. 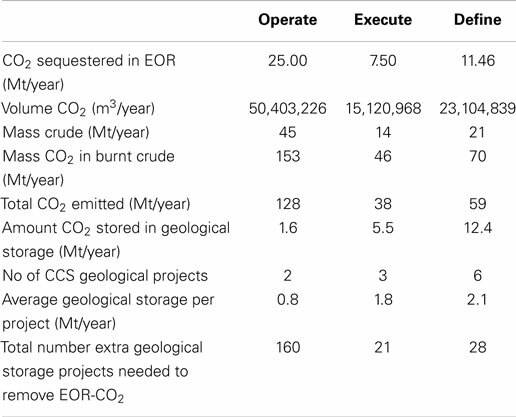 In the Execute stage, 6 of 9 projects are EOR resulting in net emissions of 38 Mt/year and in the Define stage, 8 of 14 projects are EOR giving 59 Mt/year CO2 emitted on the combustion of the produced oil (Table 5). Combining all CO2 produced by combusting the EOR products, we would need over 200 extra geological storage-based CCS facilities to sequester the CO2 emitted from EOR. This is 18 times the number of geological storage projects planned in these three phases. Obviously, this is far from ideal and is not practically possible. Therefore, it is our opinion that EOR should not be considered as a mitigation technology and instead we should be investing in CDU-based fuels. We acknowledge the economic potential of EOR versus geological storage CCS and therefore why it is an attractive option. However, when discussing CO2 mitigation, EOR simply cannot be considered a mitigation strategy when a “cradle to grave scenario” is applied. The market for hydrocarbon fuels is large, and economics drives the push for extracting evermore harder to reach oil sources, but this just further exasperates our CO2 problem. The conversion of CO2 into synthetic hydrocarbon fuels would satisfy our demand whilst limiting the environmental consequences. Table 5. Analysis of CO2-EOR projects and further mitigation requirements needed to handle additional CO2 emissions. As described above, EHR/EOR will result in more CO2 emissions. CCS will reduce emissions but at a cost and the projected rate of deployment is modest. But what about CDU? Though significant amounts of CO2 are being currently utilized, the potential is much higher. CO2 can be used as the carbon source in a wide variety of products and hence the volume of CO2 that can be utilized is high. In Figure 3, we have produced a scenario for CO2 utilization, which incorporates current uses such as urea production and replaces fossil oils in other processes to produce a small range of organic chemicals, diesel and aviation fuel, methane (synthetic natural gas), and some polymers. The case of urea is interesting. While current processes rely on hydrogen derived from fossil fuel sources, there is a drive to produce “green” hydrogen through the electrolysis of water using excess intermittent renewable energy supplies such as wind and solar. In the final section, we will consider the practicality of such an approach. We have also included the mineralization of industrial wastes providing long-term CO2 sequestration and construction materials. The potential for the creation of mineralized products from CO2 is in reality much higher, however this often involves mineralizing substances such as olivine or serpentine, which will first have to be mined. Therefore, to negate environmental impacts of mining, we have only included the mineralization of waste such as fly ash, bauxite, and steel slags. Mineralizing these wastes to turn them into commercially useful construction materials provides a favorable greener alternative to traditional disposal and should be prioritized in CO2 mineralization. Figure 3. Replacement of fossil-derived chemicals and fuels by CDU replacements assessed against CO2 emission reduction targets in the EU, USA, and globally. The graph in Figure 3 proposes the quantity of CO2 that could be utilized at different market shares based on current levels of production and compares this against CO2 reduction targets for the EU and the World in CCS, and EU and USA overall CO2 reduction targets. It can be observed that only producing 10% of each product would make significant inroads into the EU CCS target or exceed it. The potential for diesel, aviation fuel, and methane (as a synthetic replacement for natural gas) is high due to the large quantities consumed per annum. As discussed previously, although the majority of these products are produced to provide energy via combustion, hence re-releasing the CO2, the net reduction in CO2 emitted due to switching from fossil sources will be significant. 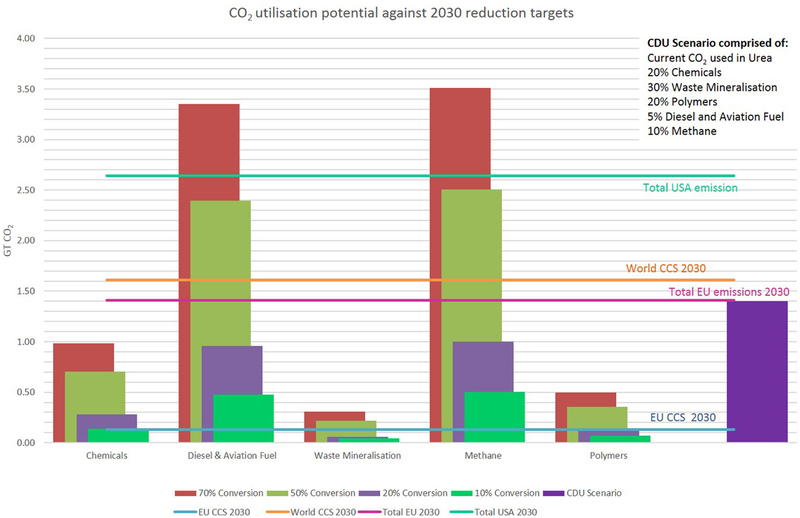 A scenario whereby 100% of the current urea, 20% of specific chemicals, 30% waste mineralization, 20% of specific polymers, 5% diesel and aviation fuel, and 10% methane are produced using CO2 is shown in the graph in Figure 3. This scenario (purple bar) represents a realistic yet challenging estimate for CDU deployment by the year 2030. In this scenario, 1.34 Gt of CO2/year would be utilized. This amount of CO2 is equal to 95% of the CO2 that must be reduced in the EU by 2030, and is equivalent to 83% of the world target for CCS by 2030. However, one question that must be addressed is how realistic is the possibility of CDU deployment on this scale. Worldwide there are a number of commercial and pilot scale CDU projects. Carbon Recycling International in Iceland is producing 5 million liters (950 t) of renewable methanol per annum from CO2 accounting for 1.5% of world production. The company has plans to expand production to bring renewable methanol to a global market outside Iceland in partnership with Methanex (the world’s largest methanol supplier). Bayer Material Science has recently invested €15 million in the construction of the world’s first commercial plant to produce polyols from CO2 as a precursor for CO2-based polyurethane foams. Based in Dormagen, the plant will manufacture 5 kt/year with the aim to have the first commercial CO2-based polyols on the market by 2016. Novomer, a USA-based company, has commercialized a range of CO2 polyols under the trade name Converge®. The polymers contain up to 50% CO2 by mass and are based on a proprietary catalyst system that produces low-cost polyols and polymers for a wide variety of applications. They currently have a 5-kt/year of capacity and have begun a plant design process to expand to make 100 kt for 2017. KOGAS DME Activities for Commercialization (2011) in Korea has been manufacturing DME from CO2 since 2000 on demonstration and pilot scale plants. KOGAS’ next phase will be a commercialized process producing 3,000 t/day of DME. The Jiangsu Jinlong-CAS Chemical Co. Ltd. in Taixing, China uses waste CO2 from ethanol manufacture to produce polypropylene and polyethylene carbonate polyol to be used as flame retardant exterior wall insulation. By 2015, it aims to have expanded production to utilize 80 kt/year CO2. The Asahi Kasei Chemicals Corporation’s phosgene-free process to manufacture polycarbonate from CO2 has been licensed to multiply companies. Five-hundred ninety-five kilotonne per year of polycarbonates are manufactured annually using this green process resulting in a reduction in CO2 emissions of 102 kt/year. This is equivalent to the proposed full global CCS plant capacity by 2020. Skyonic has opened its first commercial CO2 utilization plant in San Antonio. The plant directly captures 75 kt/year CO2, which is used to manufacture salable products such as sodium bicarbonate and sodium carbonate, and bi-products such as bleach and hydrochloric acid. Skyonic have calculated along with the CO2 utilized in the process, an additional 225 kt of CO2 will be offset by the production of green by-products. These examples show that CO2 utilization is becoming a commercial reality, with potential to make a significant difference in the amount of CO2 emitted and in creating a greener, sustainable chemical industry. The UK has announced two potential CCS facilities at power stations in Yorkshire (White Rose Project, Drax) and Scotland (Peterhead). The former is an oxy-fuel facility while the latter is a post-combustion amine capture facility. To put the argument in favor of CDU into context, we will consider the Peterhead facility as a base case. The plant will capture part of the total plant emissions, 1 Mt/year CO2, which will then be piped to a geological storage site in the North Sea. So how does that 1 Mt/year storage capacity compare with what could be achieved through CDU? The Peterhead plant has a proposed CO2 capture capacity of 1 Mt/year, which equates to 2.74 kt/day or 114.2 t/h. So how much hydrogen is needed to convert this to synthetic oil? If 1 Mt/year CO2 were to be converted into synthetic oil, this would produce 0.30 Mt/year product as the functional unit of 1 t synthetic oil would require 3.37 t CO2. So each day, 274 kt CO2 would be captured by the plant and this would be reduced to produce the synthetic oil. To a good approximation, each CO2 molecule is reduced to one -CH2- sub-unit and two molecules of water. Therefore, for each CO2 reduction, three equivalents of hydrogen are needed. This means that 44 t CO2 will require 6 t hydrogen to produce 14 t of equivalent -CH2- sub-unit and 36 t water. Therefore, 1 Mt CO2 will require 0.136 Mt/year H2 to produce 0.30 Mt/year synthetic oil. Over a 24-h period from 20:30 on 16 December, 2014 to 20:30 17 December, 2014, the average UK wind generation was 114,170 MWh, representing 12.1% of the UK energy mix. If all the wind energy were converted to hydrogen through water hydrolysis, how much would be produced? Boretti (2012) has reported that the production of 1 kg of hydrogen requires 53 kWh electricity to power the process. This is equivalent to 53 MWh/t H2 produced, which is 0.019 t (19 kg) H2/MWh. Therefore, in the generation period described 114,170 MWh would produce 2,169 t H2. If Peterhead is capturing 114.2 t/h CO2, this will need 15.6 t/h H2. Expressed as a total of the wind generation, this is 0.7%. Therefore, diverting less than 1% of the renewable wind energy to synthetic oil production would remove the need for the captured CO2 to be sequestered geologically. Of course, there are times when there is insufficient wind, or base line power consumption is high, so that this renewable energy cannot be diverted (Hall et al., 2014). However, there are also times when wind production exceeds baseline demand, for example in summer. While it is usually customary in such cases to turn off the wind turbines, we suggest that it is more environmentally and economically beneficial to utilize that excess energy to store it chemically for future use. This provides an alternative for just CCS. By adding CDU, this allows capture capacity to be diverted from a waste stream to a product stream, thereby generating income; or adding additional capacity to capture more CO2 and ultimately increase the environmental credentials by avoiding more fossil fuel use. This is summarized schematically in Figure 4, which shows how a carbon cycle can be developed as a means for seasonal energy storage. If the fuel is diverted to the transport sector, then the additional use of direct air capture of CO2 must also be considered. Figure 4. Schematic representation a CDU recycling process in a combined CCS-CDU capture system, using wind energy to power the process. In conclusion, although geological CCS will provide a reduction in the CO2 emitted to the environment, the projected capacity of CCS projects is just not on a scale compared with the CO2 reductions that are needed. Twenty-two CCS projects are described as being in the Operate or Execute phase with a projected capture capacity of approximately 40 Mt/year by 2018. However, the IEA target for CCS for 2020 is 60 Mt/year (Energy Technology Perspectives, 2014) and of these 17 are EHR projects which when considering net “cradle to grave” emissions will produce further CO2 emissions of 166 Mt/year. In comparison CO2 utilization projects are in operation, are growing in deployment and are providing a net reduction in CO2 both by utilizing CO2 in production and by providing a new fossil-free source for these products. It can be argued that in terms of emissions EHR is better than non-EOR oil production as some CO2 is sequestered. However, when one considers the large amounts of CO2 produced when oil is combusted, we would have a far greater chance of limiting climate change if we switch from oil-based fuels to CO2 utilization-based synthetic fuels. However, CDU capacity is currently higher (180 Mt/year) that operational CCS capacities (26.6 Mt/year) and utilization is predicted to reach 256 Mt/year by 2016, again much higher than CCS. This trend is likely to persist as more CDU processes move from laboratory to demonstrator scale. Furthermore, CDU can provide carbon-neutral fuels and other products that while net sequestration may be lower than in the case of CCS do add valuable products into the economy. EHR will remain a means for economic benefit but cannot be considered as a mitigation technology as it ultimately emits more carbon dioxide than it sequesters through product use. If immiscible EHR is compared against mitigation potential for CDU and CCS, the figures are +2,582:0:−469 respectively where a negative value represents sequestration and a positive value an emission. Carbon dioxide utilization will provide much needed additional capacity, with profit, in the move toward a low carbon economy. CO2 is used as a resource, not a waste. Like CCS, it should be regarded as one of the key emissions mitigation technologies in the fight against climate change. However, the same cannot be said of EHR which will ultimately lead to net CO2 emissions. Aresta, M., and Dibenedetto, A. (2010). “Indirect utilization of carbon dioxide: Utilization of Terrestrial and Aquatic Biomass," in Carbon Dioxide as Chemical Feedstock, ed. M. Aresta (Weinheim: Wiley-VCH Verlag GmbH & Co, KGaA), 335–351. Berners-Lee, M., and Clark, D. (2013). The Burning Question: We Can’t Burn Half the World’s Oil, Coal and Gas. So How Do We Quit? London: Profile Books. ISBN: 978 1 78125 045 7. Centi, G., Perathoner, S., and Iaquaniello, G. (2013). CO2: A Valuable Source of Carbon, eds M. De Falco, G. Iaquaniello, and G. Centi (London: Springer-Verlag). Hall, P. J., Wilson, I. A. G., and Rennie, A. (2014). “CO2-derived fuels for energy in carbon dioxide utilisation,” in Closing the Carbon Cycle, eds P. Styring, E. A. Quadrelli, and K. Armstrong (Amsterdam: Elsevier), 33–44. IEA Energy Technology Perspectives. (2014). Harnessing Electricity’s Potential. Paris: IEA Publications. ISBN 978-92-64-20800-1, OECD/IEA. Jansen, D., Styring, P., de Coninck, H., Reith, H., and Armstrong, K. (2011). Carbon Capture and Utilization in the Green Economy. Sheffield: CO2Chem Media and Publishing. ISBN: 978-0-9572588-1-5. Styring, P., Quadrelli, E. A., and Armstrong, A. (2014). “Preface in carbon dioxide utilisation,” in Closing the Carbon Cycle, eds P. Styring, E. A. Quadrelli, and K. Armstrong (Amsterdam: Elsevier). World Energy Council. (2013). “Time to get real – the case for sustainable energy investment,” in World Energy Trilemma 2013, ed. O. Wyman (London: World Energy Council). ISBN: 978 0 946121 22 9. Accepted: 08 February 2015; Published online: 03 March 2015. Copyright: © 2015 Armstrong and Styring. This is an open-access article distributed under the terms of the Creative Commons Attribution License (CC BY). The use, distribution or reproduction in other forums is permitted, provided the original author(s) or licensor are credited and that the original publication in this journal is cited, in accordance with accepted academic practice. No use, distribution or reproduction is permitted which does not comply with these terms.